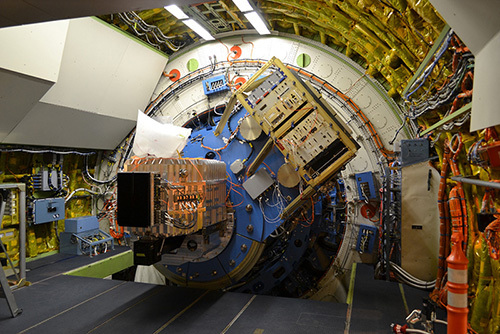 The Far Infrared Field-Imaging Line Spectrometer (FIFI-LS) is a Facility class Science Instrument. FIFI-LS is an integral field, far-infrared spectrometer. The instrument includes two independent grating spectrometers sharing a common field of view (FOV). The short wavelength spectrometer (blue channel) operates in the 51 – 120 μm wavelength region, and the long wavelength spectrometer (red channel) covers 115 – 200 μm. Each channel has a 5x5 pixel projection onto the sky, with the centers offset by 10”. The blue channel has a pixel size of 6”x6” yielding a 0.5 arcmin-square FOV, and the red channel has a pixel size of 12”x12” yielding a 1.0 arcmin-square FOV. Each spectrometer has a 25x16 pixel detector of Germanium Gallium-doped photoconductors. The 5x5 pixels FOV are re-organized along a 25x1 line, and then are dispersed by the spectrometers on 16 pixels in the spectral dimension. The spectral resolution ranges from 600 to 2,000 dependent on the observed wavelength, with higher values towards the long wavelength ends of each spectrometer. Information applicable to the current observing cycle, Cycle 6, can be found in the FIFI-LS chapter of the Cycle 6 Observer's Handbook. Those submitting proposals for Cycle 7 must refer to the FIFI-LS chapter of the Cycle 7 Observer's Handbook. Be sure that you are referencing the correct version of the handbook!